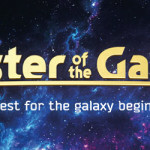 The Master of the Galaxy crowdfunding campaign enters in its final stretch on Kickstarter. With three days to go, the project achieved over $35,000 pledged and almost 850 backers. Several stretch goals were unlocked since the project launched, adding new contents and items to the game, and more can be still unlocked until August 11th. Master of the Galaxy: a view of the exclusive contents of the Kickstarter edition. 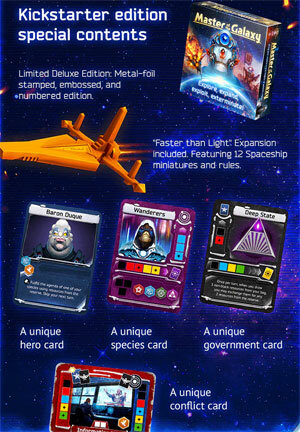 Thanks to the stretch goals unlocked, the Kickstarter edition of Master of the Galaxy will be enhanced with a new leader, Baron Duque, a Deluxe Supremacy Board, silk-screen printing to customize the four cloth bags included in the game, the exclusive card "Information War" and an additional Government card, "Deep State", to complete the unique set of Political cards included in the game. The next stretch goal, at $37,500, will unlock two heavy cardboard, laminated, four-color printed card holders – one for development cards, another for political cards. And with the final goal, $ 40,000, a full set of Development cards – one of each type, can be added to the Kickstarter edition. In these final days, other goals are ready to be unveiled. The social goals are advancing - the second level of BoardGameGeek and Facebook activation sequence were achieved and there's time to reach the final level - 400 fans on BGG and 600 on Facebook. 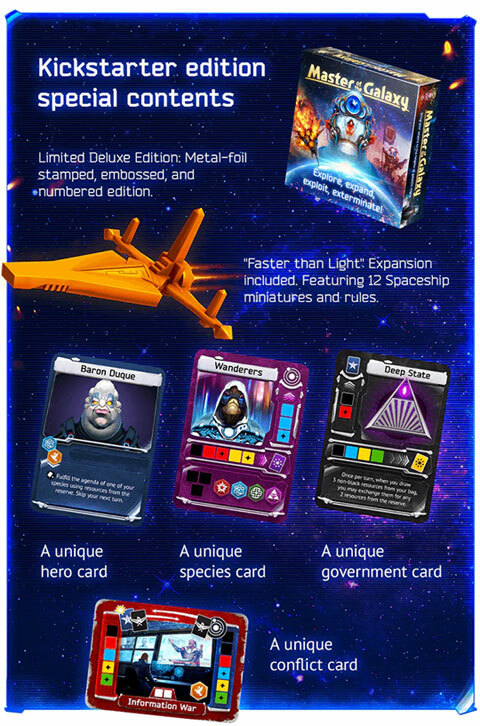 Each of this sequences will unlock enhancements to give a boost to the gameplay - one will add solitaire rules while the other will involve the back history of the game - giving a digital booklet to showcase the setting of Master of the Galaxy. If you have already seen the project but was on the fence, check it again and read the latest updates to take your decision. If you haven't seen it yet, take your chance now. For more information about the Master of the Galaxy and to pledge, visit Master of the Galaxy on Kickstarter. See also the game’s page on Ares Games website, and follow the Master of the Galaxy’s page on Facebook.